About the Institute | Sociologický ústav AV ČR, v.v.i. was established in its present form in 1990. Institute of Sociology is engaged in the pursuit of research into contemporary society and in the provision of post-graduate education in the field of sociology. It conducts ongoing and one-time empirical surveys, comparative research studies, public opinion surveys, and case studies, applying modern qualitative and quantitative research methods, and it also cultivates the development of sociological theory and methodology. Research at the Institute also makes use of information, concepts and methods drawn from related scholarly fields, such as economics, law, political science, demography, social geography, and gender studies. Institute of Sociology is located in Prague. Institute of Sociology also comprises theSociological Data Archive (SDA), the Public Opinion Research Centre (CVVM) and the Library of the Institute of Sociology. The Library of Institute of Sociology is located within the same building. Following a decision of the Ministry of Education, Youth and Sport, accreditation of the doctoral programme in sociology offered by the Faculty of Social Sciences of Charles University was extended to include the Institute of Sociology. Since 2002 the Institute of Sociology has offered two post-graduate degrees, making it possible to acquire a doctorate in sociology or in public and social policy. Both full-time and combined post-graduate study programmes are offered. Students have the same rights and obligations of post-graduate students at Charles University. At present there are 22 research projects in progress at the Institute. Most of these are funded by the Grant Agency of the Czech Republic, while others are funded by the Grant Agency of the Czech Academy of Sciences, and different ministries and foreign institutions. Smaller forms of support have also been acquired from some independent foundations and funds. 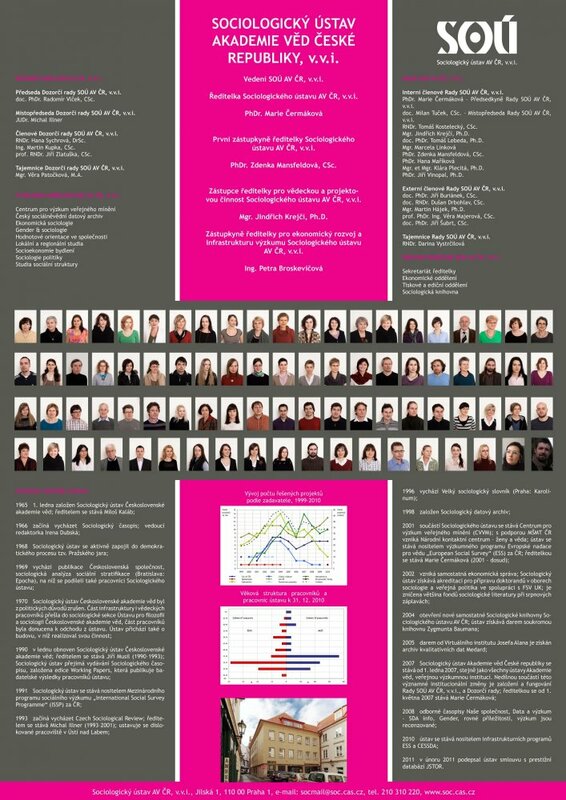 The results of the research conducted by the teams and departments at the Institute of Sociology are publicised in academic publications and domestic and foreign academic journals, and are presented at seminars and national and international conferences. The results are also made available for use by bodies of state administration, parliament, and educational and other institutions. The empirical data that are acquired as part of the majority of the sociological studies are archived in the Sociological Data Archive, where they remain available for use by the academic community, teachers and students for non-commercial purposes. 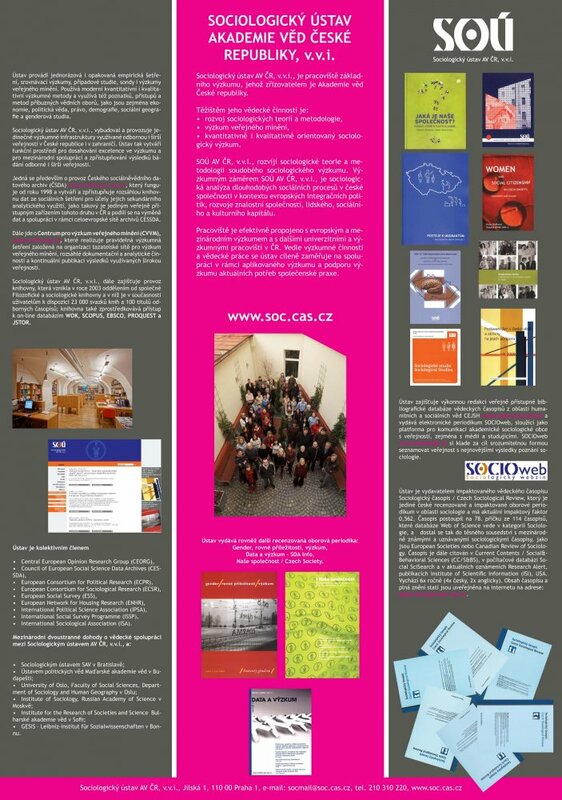 Institute of Sociology of the Czech Academy of Sciences participates in a number of multi-national and international scientific programmes. The Institute is involved in the organisation of important international scientific meetings and in the exchange of scientific information among institutions in various countries.